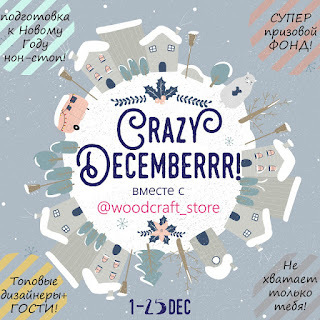 Today I am very glad to join the Crazy Decemberrr at Woodcraft Store blog as a Guest Designer. Hello Everyone! Сегодня я очень рада принять приглашение чб Woodcraft Store и присоединиться в качестве Приглашенного Дизайнера к марафону Crazy Decemberrr! Всем привет! Crazy Decemberrr is a month long project about presents wrapping, home decoration and other DIY craft ideas. A team of internationally known designers will suggest daily how to get ready for the Holiday Season. Марафон посвящен подготовке к Новому Году. Весь месяц дизайнеры будут предлагать идеи для оформления подарков, украшения дома и другие праздничные проекты. There are different traditions in many countries. The Russian Christmas will come after the New Year Celebration. I made a wine bottle tag, because historically the Russian Salad and Sparkling wine are the main elements of the New Year Party. Какой Новый Год без оливье и игристого вина? Поэтому я сделала большой тег для украшения винной бутылки. Tie a bow and add the tag with bells. Завяжите бант и не забудьте про бубенцы! Спасибо, что заскочили. Желаю всем прекрасного начала выходных! Your tag is absolutely the cutest I've seen EVER! 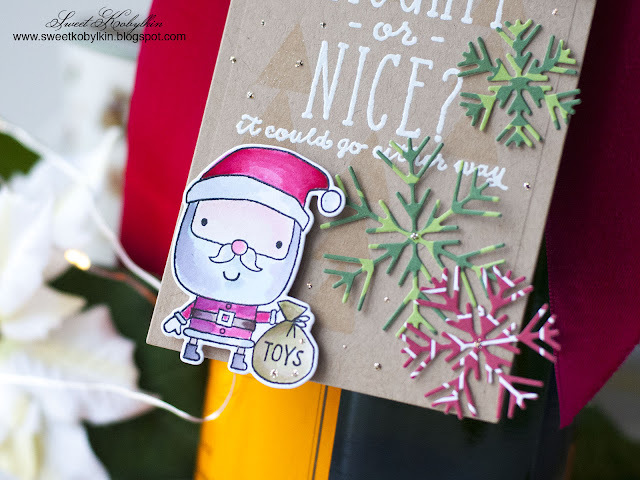 The little moose, Santa, the pink and green snowflakes...charming in every way! LOVE it! 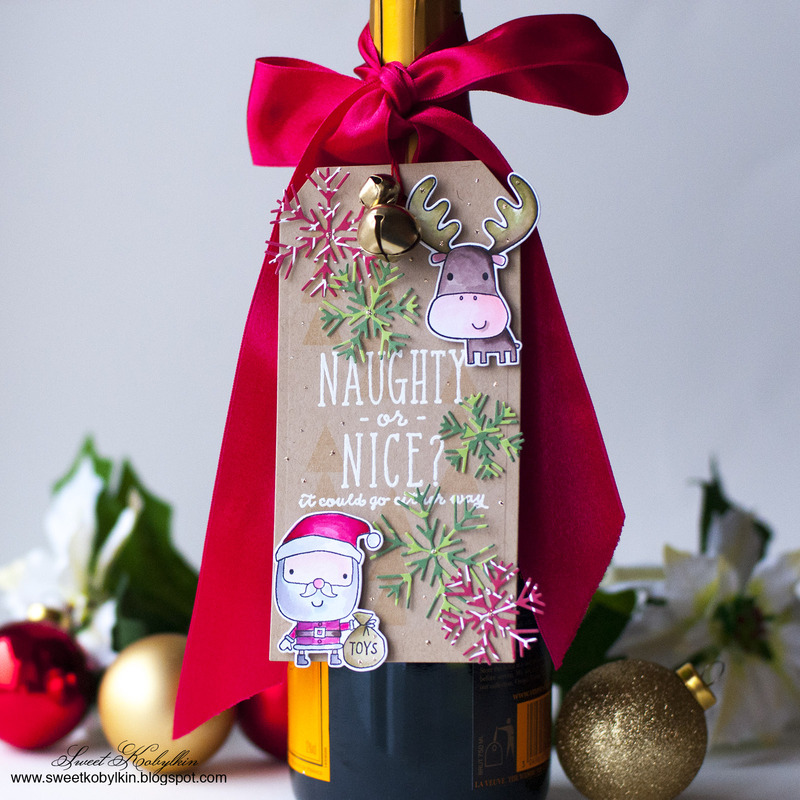 Such a lovely way to decorate your wine gift...the tag is fabulous! Thanks for joining us at Crafty Calendar. This is such a cute tag. 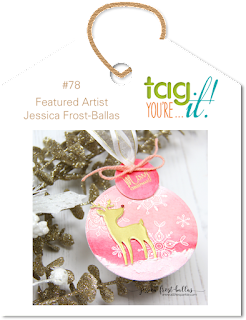 Thanks for sharing it with us at Tag You're It! So cute, love that you die cut the snowflakes from patterned paper. Thanks for joining us at Tag You're It Challenge. Your bottle tag is marvelous, Ksenija! Thanks so much for playing along in our challenge this week at QKR Stampede and good luck in the draw. Your tag is adorable! Thank you for sharing it at Tag You're It! Fabulous Christmas creation. Thank you so much for sharing with us over at Scrap & Craft Inspiration. Good luck!